Of course, as I have a couple of big projects on the go, I have decided to cast on another two projects! The first one is a favour for a friend. My friend Litlemouse, aka Jennie, is currently working on writing up her first couple of patterns. I volunteered to test one of them, as I already had the appropriate yarn and I wanted to learn how to do a beaded cast on. I have now learned how to do a beaded cast on! I got the beads from Debbie Abrahams Beads. Apparently these are the beads that Rowan used to do for knitters, but with some additional colours. I got these 0/6 in Pewter and I have to say, they are lovely! They are perfect for the colourway of yarn. 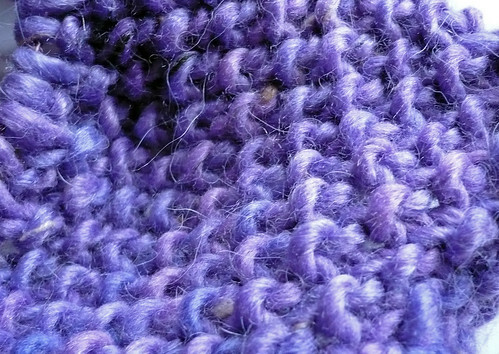 The yarn is Lang Yarns Jawoll Magic Degrade, in the delightfully named 85.0025! The scarf is currently blocking, so you will see the finished article in Fridays post. I suppose technically I shouldn't have shared these photos but I wanted to show off. I have to send a great big thank you to Leah of Good Enough, because of her recent blog post. She talked about finding out how to set the white balance on her camera. I have been struggling to get the correct colours recently as everything is "blued out" because of our rubbish Autumnal sun. I now know how to set the white balance on my camera. I'd never really known that you could do that on my camera, other than choosing the preset options of "cloudy day" or "beach". I'm so happy that my photos will have true colours even in Winter now! Thank you Leah for explaining that white balance can be changed on even point and shoot cameras like mine! In other photographic news I have recently purchased Photoshop Elements 10.0, which was half price on Amazon.co.uk on one of their Black Friday lightening deals. I'd been talking to my other half about buying this piece of software, just last week. I thought I'd leave it until after Christmas as it was a bit pricey for right now, then it popped up for half price, and the next thing I knew, it was winging it's way to me. I have installed it, and have just worked out how to do the usual tweaking I used to do on Picasa, hopefully over the coming weeks, I will improve and develop my Photoshopping skills. Anyway, back to the knitting. My second new project was instigated by an eBay bargain. I do love me a bargain LOL! I purchased three skeins of Aracaunia Azapa. Isn't it delicious? 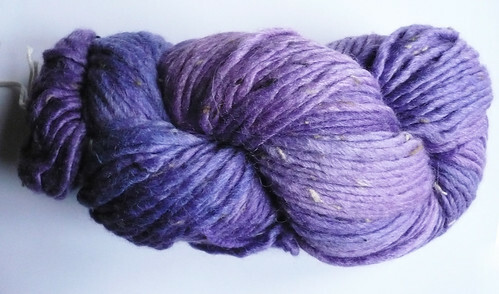 It is composed of 30% Alpaca, 45% Merino, 15% Silk and 10% Donegal. I have no idea what Donegal is. I'm assuming it is the soft brownish flecks that are in this yarn. If you know what it is, please let me know! I saw this yummy yarn on eBay and then searched Ravelry to see if there was a suitable pattern to show off it's glory in my favourites list. To my delight there was, it was the Gap-Tastic Cowl, by Jen Geigley. So I bought my yarn and it appeared very quickly. Once I had the yarn and had squished it, I had to ball it and cast on straight away! It really is so very soft and squishy, you know! 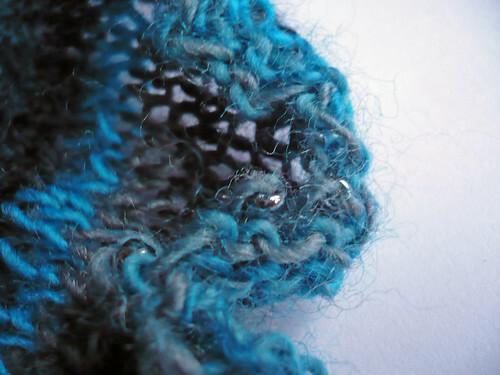 I have dropped down a needle size to 8mm as I knit so loosely. I also cast on 151 stitches, which is 20 more than recommended. I have 420 yards to use, rather than the 306 yards the pattern suggests. 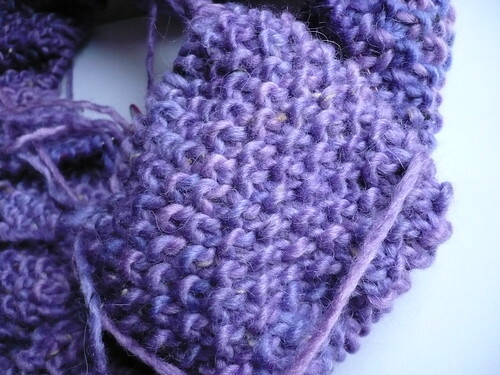 I want to make it a bit longer and hopefully a bit wider, so I can use it a bit like a hood as well as a cowl. I am alternating the skeins every couple of rows as the yarn is hand dyed and each skein is different. I'm also swapping out one of the skeins every 10 rows or so. 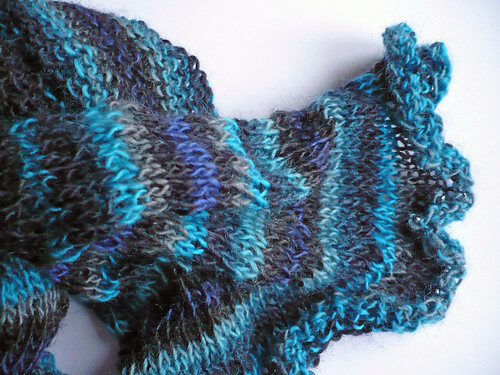 I did a provisional cast on, using a Knit Pro cable with stoppers on. I did this so that I could make the outer edges match, with a stretchy bind off. This is a lovely loose knit and I don't want to spoil it with tight edges. I am enjoying this project so much. It is pretty mindless and I can knit it without watching. It is perfect knitting for my current obsession of watching The Killing in the original Danish, which was shown recently, on a nightly basis. I recorded it so I could watch it in one chunk and join in with discussing the current obsession in the knitting community, "The Killing Sweater". I watched the US version and LOVED it. I didn't watch the original series as I like to knit while I watch tv and subtitles make that difficult. Now I have the perfect knit to be able to watch subtitled tv with! I am trying to watch the entire first series so I can catch up and watch the second series as it appears on tv. I thought that I would be bored by watching the same show twice, but the Danish and the US versions are different enough to still be riveting, not to mention the acting in both is equally compelling. Gosh, this a LOOOONG post. Sorry about my waffle. Please click on the button so see less waffly posts from my companions in WIP!